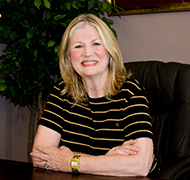 Linda M. Castle holds a Bachelor of Science Degree from Louisiana State University and a Master of Arts Degree in Psychology, Counseling Option, from McNeese State University. Linda has a general practice, focusing on individual issues, resources for career and academic counseling, group and individual treatment for problem gambling and she specializes in the practice of Marriage and Family therapy, working with life difficulties that lead to disturbances for the individual and in the family. Appointments are available in the morning, afternoon and evening, Monday through Thursday. Consulting your insurance company in advance regarding the extent of your mental health coverage is advised.